The saying “good things come to those who wait” has never been so apt. Despite riding the waves of triumphs and failures since Seedorf was hired as manager, and especially enduring the media onslaught when we crashed out of the Champions League, fans who listened to Seedorf’s pleas for patience were richly rewarded today. Three great goals, a clean sheet, and three points are only the statistics. This match means so much more to the patient and faithful. It was easy to feel good about the match early on. 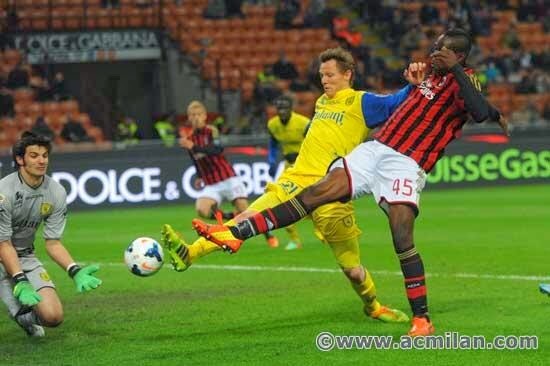 Balotelli opened up the scoring with a bullet on the volley from a Rami cross in just the fourth minute. 1-0 Milan. With 17 shots and five on goal, I can’t really remember a time that Milan didn’t control the match. Not even cheap shots at the big man could derail the match. Despite being the victim of sucker punches and dirty kicks and even being hacked down off the ball in the middle of the match, Balotelli stayed cool. Which was probably even more impressive than his fantastic performance. 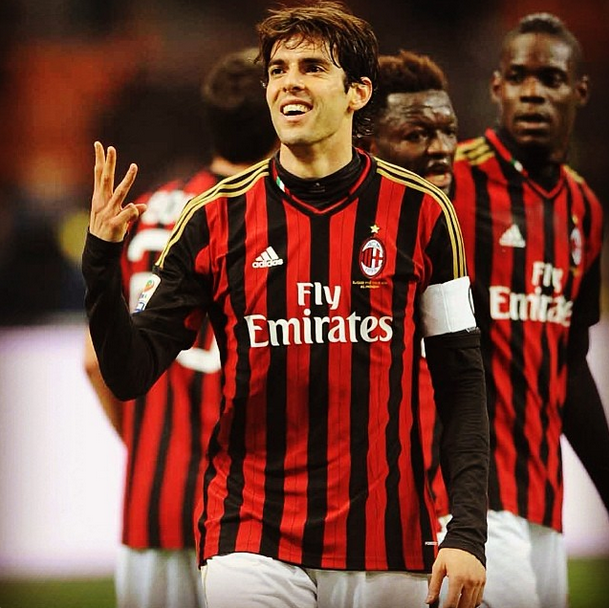 But it was Kaka who stole the show. Playing his 300th match for Milan, in the 27th, he chested down a great cross from Honda to slot it in. 2-0 Milan. It was his 103rd goal for Milan, but he didn’t stop there. In the 54th, from distance, he sent in an exquisitely curling ball just inside the far post. 3-0 Milan. Pure magic. Despite Chievo being a relegation-threatened team (and playing like it,) Milan cruised to this victory comfortably. Meaning that they played as a team, they had enough stamina to last the whole match, and even showed some of that Milan class that we’ve been missing. Defensive errors were kept to a minimum, and fortunately, the late penalty that Zaccardo conceded was a miss by Thereau, so we kept the clean sheet. My favorite stat this season is the number of tackles, as I feel this shows our desire to fight and win more than any stat. And tonight, we had a whopping 25 tackles. This was the kind of performance we have been waiting for, even if it was only against Chievo. Of course there were a few worries. Like Muntari being stretchered off just before the half with an injury. Or the way Taarabt was showing off his little tricks and then got schooled by Guarente in the 85th.Taarabt played very selfishly on the night, even missing a Honda pass completely after being shut down himself just seconds earlier. But as a team overall, it was a very solid performance. And it’s been a long time since I could honestly say that. Taarabt, that might be the closest you ever get to Real Madrid playing like that. So three games in seven days: a draw vs. Lazio, a win over Fiorentina, and now a convincing win over Chievo. I’m sure there will still be bumps in the road, but like I wrote after the Fiorentina win, I think the momentum is finally swinging our way. I have seen steady growth in the team since Seedorf arrived, despite some of the results. Maybe I’m just too optimistic, but I can see the team just going upward from here. Which feels so great to say after the season we’ve had. I could be wrong, but it seems to me that this match showed exactly what patient Milan fans had been waiting for, and gives us hope, even for the rest of this season. Welcome back, Milan. We've missed you.